One evening last winter I was startled out of a quiet moment of meditation when an owl started hooting outside my bedroom window. It was obviously an owl, but I didn’t know what kind. “Hoot-hoot-hoo-hoooo,” he said. Or she. How would I know? I scrambled for my phone and looked up owls likely to be lurking in Michigan, and after listening to an assortment of unearthly screeches, I came upon the lovely barred owl. The barred owl’s call sounds something like (and here is the standard, agreed-upon translation): “Who cooks for you, who cooks for you-alllllllll.” Sure enough. Since then, I’ve been dreaming of raptors. Not dreaming exactly, but in my imagination owls and hawks do seem to perch on my shoulders—gently, as they have knife-like talons—and ruffle their wings and bob along as I hike across open meadows in my mind. I don’t know why. Apparently many folk traditions associate owl sightings with imminent death. But these particular imaginary shoulder-riders seem companionable enough. Meanwhile, this spring, for some reason, I’m listening to birds. They chitter and chirrup and whistle and whoop in the little wooded area behind my house, and I can’t concentrate because I want to know who they are and what they’re saying. Are they louder this year? I’ve never found birds so distracting. It’s driving me crazy. But other ordinary citizens of my yard, the robins, cardinals, sparrows, chickadees, goldfinches—I see any number of them every day and have never listened carefully enough to learn their avian grammar. I have no idea who is saying what, let alone what they’re saying. “Stay away”? “Mate with me”? “I’m a happy birdy”? Beyond appreciating the cheerful sounds of birdies-in-general, I’ve considered their layer of reality unimportant to me. We don’t bother to understand what we don’t deem important. I wonder how many other layers of reality I’m ignoring. How thin is the little layer of my attention? What are the trees saying? What is the sky saying? Biologist and essayist Robin Wall Kimmerer writes that in the language of her ancestors, the Potawatomi, seventy percent of the words are verbs and the complex system of inflections in the language is based on whether things are animate or inanimate. Of course, living things like people, moose, and sumac take the animate form, but so do rocks, mountains, water, and fire. Words that turn up as nouns in English turn up as verbs in Potawatomi. The word wiikegama, for example, means “to be a bay,” as if an inlet of water isn’t just sitting there as a noun—it has its own kind of aliveness, of being. The grammar of the language awakens attention to other layers of being, thus unfolding, perhaps, other layers of wisdom. Unsurprisingly, as with so many native languages, Potawatomi is severely endangered. When Kimmerer wrote the essay (published in 2013), only nine fluent speakers remained. Certain particular wisdoms inhere in each given language. I wonder if the owls and hawks and cardinals and sparrows seem to beckon me to hear their languages right now because I’m exhausted by human words. Words are the water I swim all year. I read them by the bushel and beguile students into reading them. I write them and wrestle with them and prod students to write them and then I evaluate them. I sing them and listen to them and pray them at church. Our political life is a roaring waterfall of words, some of them stinking and toxic. Much chatter in the past eighteen months exhorts Americans to get out of our echo chambers, listen to a range of voices, show compassion for other points of view. Very true, good idea, yes, yes. And I do try. For the sake of sanity, I’m choosing carefully, trying to avoid the vacuous and mean, finding books and podcasts and Twitter feeds and personal connections that teach me to hear new voices. But the birds seem to be calling me out of the human-words echo chamber entirely. This comes as a relief, because whatever those birds are saying, cynical skepticism need not apply. No moral discernment needed, no political judgement. They lie not, neither are they corrupt. Their conversations are refreshingly edifying. The birds are just being birds. Yesterday, I managed to identify a tufted titmouse. Took me a long time, listening to its clear whistle: “peter peter peter peter.” Of course there are many bird identification apps (yes, I’ve downloaded the Cornell Lab of Ornithology app) and shelves of field guides. But they typically begin with seeing the bird. Well, what if I can’t see it? What if I can only hear it? I look out into the backyard when I hear a voice, and often all I see is a tangle of branches and trembling galaxies of new green leaves. You can’t easily search the internet for a whistle. So instead I searched for birds I thought might be hanging around in my backyard, listened to their various calls on YouTube, and finally found something close, though it was a slightly different pitch and a different number of peters. 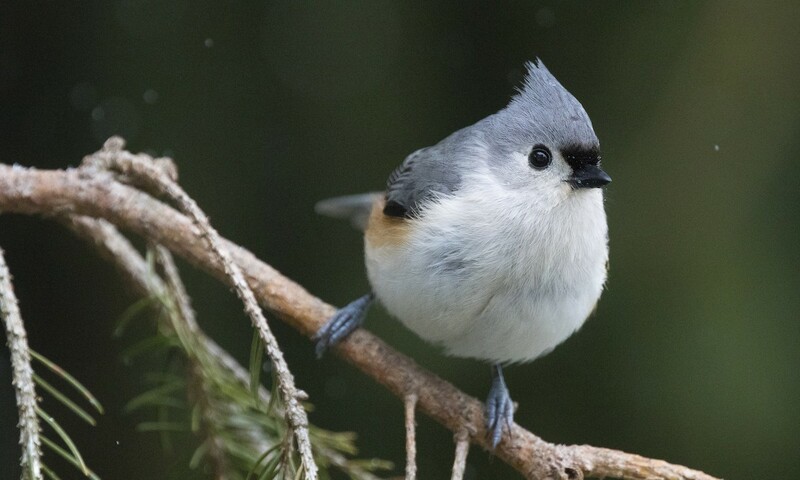 Still a tufted titmouse? Turns out each species has many different calls, and each bird is an individual. This is complicated, and I’m like a two-year-old learning ABCs. I suppose bird-knowledge only comes with patient experience and personal teachers. All you serious birders out there are now going to glom onto me with your advice. That’s great. Bring it on.